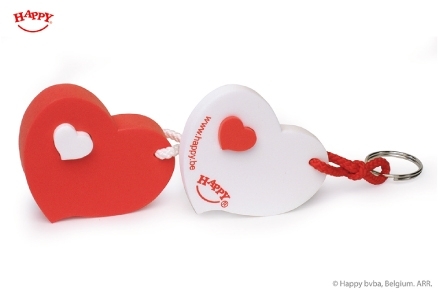 Win the heart of your customers with your own Key Holders! 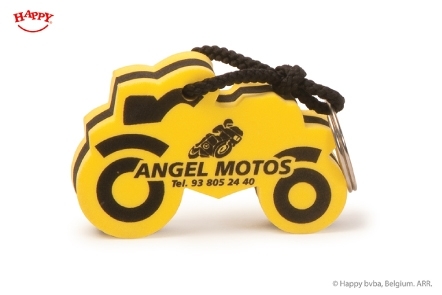 The Happy foam Key Holders are a useful, original and long-lasting promotional gift, made out of high quality, skin friendly and solid EVA-foam, 100 % made in Europe. They are fully customizable: not only can you choose the size, foam colour and printing, you can even choose the ring attachment. There are countless possibilities, let your creativity flow! How to customize my own Foam Key Holders? Before you can start with the design of your artwork, you have to choose the printing technique. Each printing technique has its qualities as well as its restrictions, which have to be taken into account first. - Does your artwork or logo has up to 3 different colours? - Do you want your print to be as sharp and clear as possible? → screen print is the right option for you! Screen printing is a method of creating an image by pressing ink through a screen (or mesh) with areas blocked off by a stencil. Each colour is printed separately. We let the first print dry for 24 hours before printing the second. Note that white ink always needs a double printing passage in order to get a beautiful result on the foam. - Does your artwork or logo has 4 different colours or more? - Do you want to print digital photos or colourful designs? → digital print is the right option for you! Starting from 4 colours digital printing is more appropriate and cost-efficient for you. Digital printing is done by only 1 print passage by which all colours are printed simultaneously by a digital printer. We have a very big assortment of Foam Key Holder shapes and sizes. 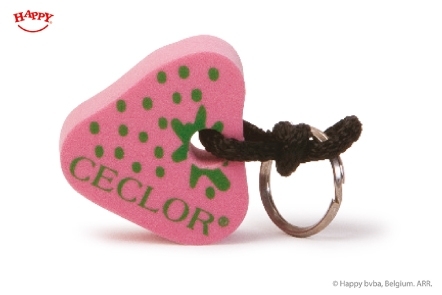 We assorted them thematically, to help you find the right Key Holder for your audience. Size group A is the smallest, size group D is the largest. Do you have a creative idea? It's also possible to make a custom shape, according to your wishes. Contact us for more information. Go crazy and make your key holder as unique and beautiful as possible! In case of one foam layer there are only 4 possibilities for the foam thickness: 0,6, 0,8, 1,6 or 3 cm. 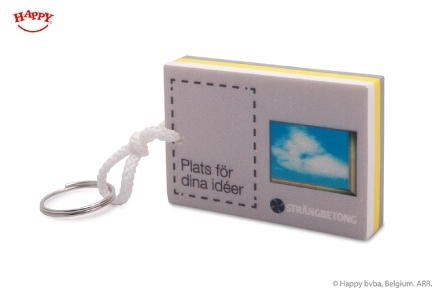 A key holder with a thickness of 1,6 to 3 cm with one key attached floats in water! Of course the floating capacity depends on the volume of the entire key holder and the weight of your key. The indicated combinations of foam layers are just examples. Make your own combination starting from foam layers of min. 2 mm up to max. 30 mm thickness. If you want to use a 'chain' or 'ring only' attachment (step 5) we advise to choose for a max. thickness of 8 mm. For key holders with a thickness until 3 cm the cord is perfectly suitable. We offer a wide range of colours, fully tailored to your wishes. Since we value fast deliveries, we selected 8 standard colours, which are available in stock. 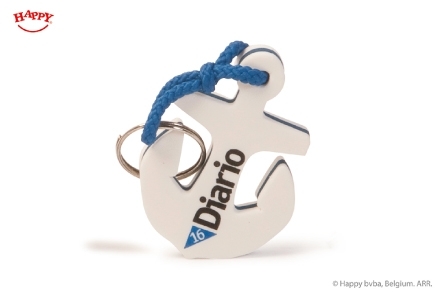 To make the perfect match with your logo, there are more than 300 special or customized colours to make your Happy promotional gift as personal as you want. You can choose another foam colour to perfectly match your logo and design. If it's a colour that we have never used in foam, a lab-test will have to take place. This has an effect on the delivery time. Send us the details of your desired pantone colour. If you want to know the desired minimum order quantity of the product of your interest, please contact us. We offer the cord as in the pictures above (1 & 2) in 7 colours: black, white, yellow, orange, red, dark blue and light green. We deliver the key holders standard in bulk in an export box. At your request we can pack the key holders individually in a nice polybag. If you want we can even add your customized card to it and make the perfect giveaway package for your customers! Once you have gone through all the steps and made your choice, fill in the price quote to ask for a tailor-made offer. With the order you will receive our key holder template and detailed guidelines, enabling you to make a print-ready design. These guidelines have to be read thoroughly by your designer because printing on foam is not the same as printing on paper. In short, we already want to inform you that details smaller than 2 mm in your layout partly disappear and will not be visible after printing on the foam. For positioning reasons a tolerance of 2 mm between different coloured lines and objects has to be taken into account (screen print only). We are looking forward to your creative design! Fill in the price quote form completely to get the best tailor-made offer ever. Within 48 hours you will receive our offer. Upon your agreement of the offer we will send you the template and the very important artwork guidelines. After we have approved your artwork, we will send you the order confirmation. We expect you to make up your artwork and send us your print-ready design, in accordance with the artwork guidelines and on the template provided by us. If you prefer, our graphic department can make up the artwork for you (at € 55 per hour). As soon as we receive your artwork our graphic department will check if it’s ready for production. If changes are necessary, we will feedback you. If changes to your artwork are necessary, we expect you to resend the appropriate design. If you prefer, we can also do the necessary changes for you at € 55 per hour. c) physical pre production sample* (by mail: see cost (b) + € 100). *a photo and pre production sample delay the lead time with minimum 1 week, according the timing of your approval. As soon as our graphic department has approved your design, production preparations can start. From this moment we start counting the delivery time. After approval of the digital sample/ photo sample/ pre-production sample, any change to the artwork will be charged at € 35 per change + the cost for a new film. Any changes after the agreed order confirmation, such as: change of delivery address, delivery date, change of transportation, invoice address, … by you, will also be charged at an administrative cost of € 35. Check the provided sample carefully. As soon as you have accepted, the production can and will start! Cancellations must be in writing. All costs incurred will be charged. In case the buyer cancels the order totally or partially, a compensation of minimum 30 % of the cancelled order has to be paid. In case the goods are printed following the specifications of the buyer, the order can not be canceled and the total amount has to be paid. We appreciate that not all promotional actions require the indicated MOQ. We will happily undertake smaller orders, at an additional cost depending on the required volume. Rush productions are possible in consultation at an additional cost. We make every effort to ship the exact quantity ordered but reserve the right to ship 10% over/under. If this is not acceptable please advise in advance.